Amazing – this is how our guests describe Sabah in one word when they visit. Indeed Sabah has a lot to offer. Sabah offers natural beauty, exotic animals, majestic mountains, flora & fauna, mesmerizing dive sites, friendly locals and of course, an adrenaline rush in the form of white water rafting the mighty Padas river! Our young adventurer groups are pictured here having the time of their lives. The white water rapids of Borneo are now more adventurous than you can imagine. 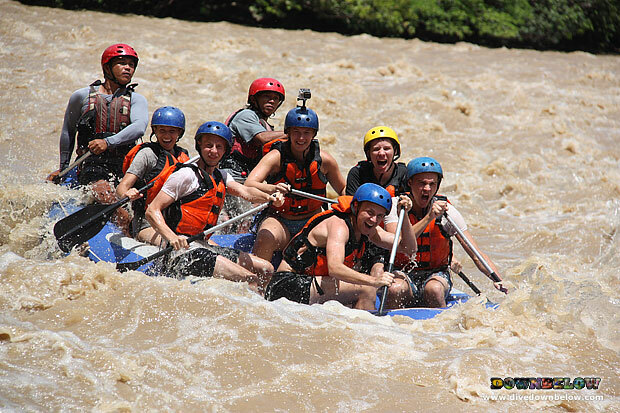 The 10km of white water rafting makes it one of the longest rafting journeys in Borneo. Yearning for some white water adventure? Contact our Travel Centre and we can try to accommodate the activity into your holiday in Borneo.